For four glorious laps, Jack Miller led his home Grand Prix last year. It won’t be a surprise this time if he does it again. In a little over a week’s time at the Island, Miller will make his Ducati debut at a circuit where top speeds on the downhill chute towards Turn 1 will be north of 340km/h. Ducati hasn’t won at the Island since the fourth victory of Casey Stoner’s six-year unbeaten run in 2010, with Honda riders Marquez and Cal Crutchlow (2016) taking the past three wins in Australia. 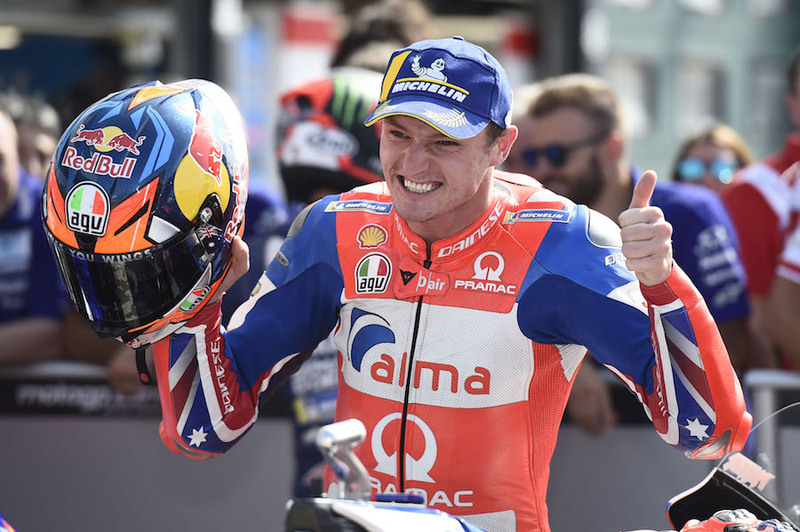 Jack Miller doesn’t lack ambition – no MotoGP rider with aspirations of sustained success on the international stage does – but six minutes into his home Grand Prix at Phillip Island last year, the Australian rider’s head was spinning. Three weeks earlier, he’d snapped his right tibia in a training accident, a plate and eight screws in his leg causing him to miss the race the week prior in Japan. And now here he was, leading his home race, and wondering what on earth he was supposed to do next. Leading races in the top flight was nothing new for Miller, of course; the Australian memorably won the Dutch TT at Assen in 2016 for Marc VDS Honda on a day where teeming rain brought the Townsville product’s renowned wet-weather skills to the fore. But in dry conditions, on a second-string Honda and leaving the likes of Marc Marquez, Valentino Rossi and Jorge Lorenzo in his wake just two corners into his home race? It was a situation so far off Miller’s radar that he hadn’t contemplated his next move. For four glorious laps, Miller’s number 43 sat atop the leader board as the field scythed around Phillip Island’s sweeping curves, the Australian an unexpected interloper in the title fight between Honda’s Marquez and Ducati’s Andrea Dovizioso. From an equal career-best qualifying position of fifth the day earlier, Miller would eventually finish seventh, but just 5.6 seconds behind race-winner Marquez in one of the most frantic Grands Prix the Island has ever seen. It was a strong weekend under any circumstances, one made all the more meritorious by the battered body he carried into the Island outing. Twelve months on, Miller still recalls those opening 366 seconds of his race with a huge grin. “To lead the first few laps of my home Grand Prix … it was fun, nerve-wracking as hell, but the most amazing feeling,” he says. “I was thinking ‘is this really happening?’ Being in the lead felt like forever. I got a decent start, and then Marc ran wide and opened the door for me, so I pushed through. I thought there was no better place to be on the first lap than first, especially into (Turn 4) with all of the others behind me. I had a really good opening couple of laps and was able to pull a gap on the other guys. But I might have got a bit carried away. “After I watched the race back, I was like ‘damn, I had a big lead’. Whoever was behind me, I just wanted them to come through because I wanted a marker, someone to set the pace so I wasn’t out there spinning the tyre off its head and destroying it. That next time comes in a little over a week’s time at the Island, where Miller will make his Ducati debut at a circuit where top speeds on the downhill chute towards Turn 1 will be north of 340km/h. The Ducati Desmosedici is renowned as being the fastest bike in a straight line on the grid, used by the likes of Dovizioso, his factory Ducati teammate Lorenzo and Miller to blast past their rivals on the straights at every circuit on the world championship calendar. Ducati hasn’t won at the Island since the fourth victory of Casey Stoner’s six-year unbeaten run in 2010, with Honda riders Marquez and Cal Crutchlow (2016) taking the past three wins in Australia. Marquez’s form this season and his affinity with the Australian circuit will have him installed as favourite for the Michelin® Australian Motorcycle Grand Prix 2018, but Miller’s recent home record should have him confident of a strong result. Fifth on the grid at home for the past two years, his best qualifying results until he snared pole in Argentina at the beginning of the 2018 season, show he has one-lap pace to burn, while he already has a win on his Australian CV, taking the Moto3 race in 2014 before stepping up to MotoGP the following year. Miller has a perfect MotoGP points-scoring record in Australia (three top-15 finishes in three starts, the only other race he’s finished in the points in every start besides Germany), and, with four races remaining, is on track for a career-best season; he scored 82 points a year ago, and sits on 74 with Japan, Australia, Malaysia and Valencia to come. Setting a new high is a goal, as is breaking into the top 10 in the championship by season’s end. “I had some strong results in this part of the championship last year, definitely in Australia and Malaysia, so the top 10 is still reachable for me,” he says, his thoughts immediately turning to the Island. “The pressure and attention and all of that can get to some people with their home race, but it’s my favourite one of the year. The track is one thing, but the fans, the people, all the faces you know … the atmosphere is my favourite. It always seems to go too fast when you’re there. But I love that race so much, so can’t wait to get down there and have a crack at it again.